Home > Shop By Brand > BLACKFIRE Pro Detailers Choice Car Care Products > BLACKFIRE Interior Cleaner 32 oz. The only cleaner you need for all your car's interior surfaces! BLACKFIRE Interior Cleaner is a versatile, water-based cleaner for all leather, vinyl, velour, carpet, headliner fabric, wood, plastic, and metal. It is designed to be both gentle and effective, and it contains no harmful ingredients. BLACKFIRE Interior Cleaner uses Swedish non-ionic surfactants to safely clean all interior surfaces. 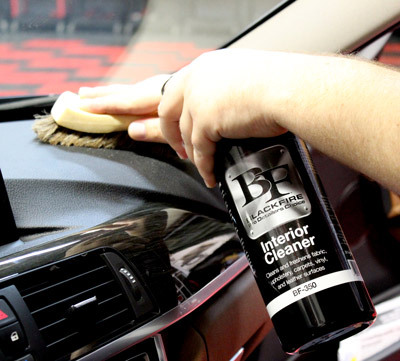 Use BLACKFIRE Interior Cleaner to maintain a clean, inviting interior with just one product! Many automotive interiors are finished with leather, vinyl, wood, carpet, fabric, metal and plastic surfaces. BLACKFIRE's advanced technology Interior Cleaner will safely and effectively clean all of these surfaces, replacing a whole shelf full of cleaners. This is one of three products introduced by BLACKFIRE that takes advantage of recent breakthroughs in chemical engineering. One of these breakthroughs occurred in a group of cleaners called non-ionic surfactants. These water-based cleaners replace the acids, butyl and butyl ethers found in many car care cleaners. BLACKFIRE's advanced technology Interior Cleaner is built around a state-of-the-art, non-ionic surfactant developed in Sweden, late in 2002. The vast majority of cleaners in this country contain butyl or butyl ether. This cleaning agent is highly effective and inexpensive. On the downside, butyl dries the surface being cleaned, can dull some plastics, can stain aluminum, is very harsh on your skin, can cause respiratory distress (coughing) if inhaled and is the subject of a continuing debate over environmental biodegradability. In short, it works and it's cheap but it's not friendly to people, some materials or the environment. Butyl has been legislated out of cleaning products in several European countries the same way VOCs (volatile organic compounds) have been legislated out of some products in this country. Sweden leads the world in butyl-replacement research and development. The new ingredient used in BLACKFIRE Interior Cleaner is the very latest in non-butyl cleaning technology. BLACKFIRE Interior Cleaner is a 100% water-based multi-material cleaner. It contains no acids, no butyl of any kind, and no petroleum distillates. If a material can be cleaned with water, it can be cleaned with BLACKFIRE Interior Cleaner. It's even safe as a hand cleaner. It will quickly and safely remove all manner of dirt, grime, oils and stains from almost any material. Use it on leather (except suede and knapped leathers), vinyl, velour, carpet, headliner fabric, wood, plastic, and metal trim. It will not dry out the material being cleaned (including leather), streak plastic or aluminum and poses no known threat to the skin or respiratory system via vapor inhalation. Automobile interiors contain leather, vinyl, wood, fabric, metal and plastic surfaces. BLACKFIRE Interior Cleaner safely cleans them all! Formulated with advanced water-based, non-ionic surfactants. Contains no butyl or petroleum distillates. Use on: seats, dash, door panels, carpets, fabric upholstery, leather and vinyl surfaces. Penetrating formula releases dirt and grime. Pulls even the most stubborn dirt up. Easy to work with as you can use it on just about anything. Definitely my go-to cleaner for interiors. ProsSingle product for multiple cleaning applications. ConsA bit pricey for this size bottle. Pick up the gallon size bottle if you can afford it. I was hesitant to spend this much on an interior car cleaner but it's worth every cent. Totally removed crusty mud that was on the back seat and on the back of the drivers seat effortlessly. I love that it is a multi-surfa product and water based. Cleaned upholstery, carpet, dash, doors and leather. Would buy it again. Did a better than average job, but overall I feel that Pinnacle is a touch better. This product even removes grimy built in dirt on auto vinyl interiors. I too had gotten a sample bottle of this, and decided to give it a try. Agree with other's comments for the reasons they state. Pulled lots of dirts off the dash and door panels on my Daily Driver, leaving just an even clean new look after. Simply come behind with your protectant of choice to finish.